A review of available law enforcement and laboratory sources in Florida demonstrates that Kratom does not currently constitute a significant risk to the safety and welfare of Florida residents. According to the Florida Department of Health (DOH), no pervasive health issues have been attributed to the ingestion of Kratom products in Florida. Diagnostic tests that would reveal the presence of Mitragynine are not routinely performed on patients during emergency room visits. Therefore, arriving at the precise number of Mitragynine exposures that result in harm to the patient is difficult to assess. + Kratom (Mitragyna speciosa) is a plant substance which is marketed and commercially available over the Internet and in Florida at many convenience stores, gas stations, head shops, and vapor stores. The ingestion of Kratom involves the use of the leaves either whole or crushed, prepared as a tea, smoked or chewed; or as an extract or encapsulated powder. Mitragynine and 7-Hydroxymitragynine are the major active alkaloids found in the Kratom plant; neither Mitragynine nor 7-Hydroxymitragynine are enumerated as controlled substances under federal statute 21 USC 844 (Controlled Substance Act) or Florida Statute 893 (Drug Abuse Prevention and Control). Accordingly, all parts of the plant and its extracts are legal to cultivate, buy, possess, and distribute without a license or prescription. The U.S. Food and Drug Administration (FDA) has not approved Kratom for human consumption citing “inadequate information to provide reasonable assurance that such ingredients do not present a significant or unreasonable risk of illness or injury.” As a consequence, the FDA issued an Import Alert regarding shipments of dietary supplements and bulk dietary ingredients that are, or contain Mitragyna speciosa or Kratom allowing for the detention without physical examination of specified products from the firms listed in Import Alert 54-15. This alert is updated as new firms are added to the list. Kratom has been described as producing both stimulant and sedative effects depending on dosage. Reportedly, Kratom use at low doses produces stimulant effects and at high doses sedative effects. Side effects on the body include nausea, itching, sweating, dry mouth, constipation, increased urination and loss of appetite. Some literature suggests that Kratom/Mitragynine may have a role in treating the withdrawal symptoms of opiate addiction. Academic studies are ongoing. Drug Enforcement Administration (DEA) literature indicates no legitimate medical use for Kratom in the United States. The FDLE Laboratory System reflected a low number of submissions (1 to 6) annually between 2011 and 2015. Seven labs associated with various counties also reflected a low number of submissions (1 to 2) over multiple years. The laboratory utilized in toxicology testing by Florida Medical Examiners districts reported that from January 1 through November 2015, Mitragynine was present in ten cases analyzed by the lab. Some Florida counties have proposed ordinances related to Kratom; however at this time, Sarasota County is the only county known to have passed an ordinance related to the marketing of “designer drugs” among which is Kratom. This ordinance puts the responsibility on the seller of the substances. The Florida Legislature considered a proposed bill to schedule Kratom during the 2015 legislative session, though it died in committee. A similar bill filed in anticipation of the 2016 legislative session proposes to add Mitragynine and 7-Hydroxymitragynine to Schedule I of Controlled Substances found in Florida Statute Section 893.03. Several states responded to a request for information regarding Kratom. Among the states that responded, three (3) have regulated or scheduled Mitragynine and 7-Hydroxy-mitragynine as controlled substances with two (2) others considering legislation in reference to Kratom. Illinois and Louisiana enacted legislation with respect to the use of or distribution to Kratom to minors. A review of information currently available through identified law enforcement and laboratory sources in Florida indicates that Kratom does not constitute a significant risk to the safety and welfare of Florida residents. The Florida Department of Health (DOH) reports no pervasive health issues attributed to the ingestion of Kratom products in Florida, though diagnostic tests that would reveal the presence of Mitragynine are not routinely performed on patients during emergency room visits. It is unclear how many Mitragynine exposures resulted in harm. Kratom use or abuse is not monitored by any national drug abuse surveys and much of the information regarding possible deleterious effects of Kratom use or abuse remains anecdotal. 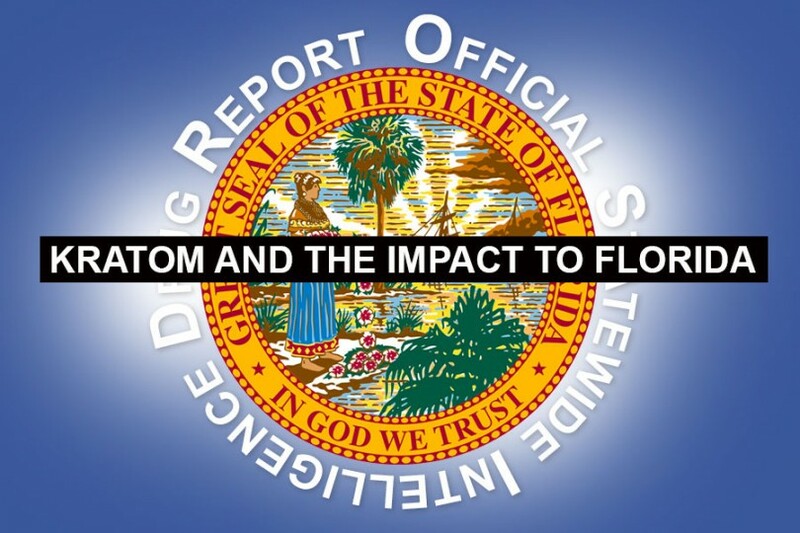 This drug report will examine the extent to which “Kratom”, or more specifically Mitragyna speciosa, and the botanical mixtures derived from it are impacting public safety in the state of Florida. Mitragynine and 7-Hydroxymitragynine are the major active alkaloids found in the Kratom plant (Mitragyna speciosa), a tropical tree related to the coffee plant which is indigenous to Thailand, Malaysia, and Myanmar in Southeast Asia. The ingestion of Kratom involves the use of the leaves, which are approximately five inches wide and seven inches long, and are either whole or crushed, prepared as a tea, smoked or chewed; it can also be found in the form of an extract, or encapsulated powder. Neither Mitragynine nor 7-Hydroxymitragynine is currently enumerated as a controlled substance under federal statue 21 USC 844 (Controlled Substances Act); or within Florida under Florida Statute 893 (Drug Abuse Prevention and Control). This means that all parts of the plant and its extracts are legal to cultivate, buy, possess, and distribute without a license or prescription. The substance is available on the Internet and in some instances is marketed as a legal psychoactive product with alleged medicinal benefits. Some literature suggests that Kratom/Mitragynine may have a role in treating the withdrawal symptoms of opiate addiction. Academic studies including research by the University Of Mississippi School Of Pharmacy are ongoing. The FDA stated in their alert that “there does not appear to be a history of use or other evidence of safety establishing that Kratom will reasonably be expected to be safe as a dietary ingredient.” Due to “inadequate information to provide reasonable assurance that such ingredients do not present a significant or unreasonable risk of illness or injury,” the FDA has not approved Kratom for human consumption. At the request of the FDA, Customs and Border Protection (CBP) at the Port of Cincinnati, Ohio has seized seventy one shipments with an aggregate total of five-thousand four-hundred pounds of Kratom powder. Kratom is not the first popular dietary substance to be the subject of an FDA alert. In November 2003 the FDA issued alert P04-106 to remove ephedra-containing dietary supplements from the market. The FDA alert on the ingestion of ephedra-based dietary supplements was not without controversy, and the ban on ephedra and ephedra-containing alkaloids was briefly overturned because of pressure applied by members of the supplement industry before ultimately being upheld. Like Kratom, ephedra is also a botanical derivative that has traditionally been used for a variety of medicinal purposes, including weight loss and to provide an increase in stamina. The FDA acted in response to the growing concern about the possible increased risk of ephedra users suffering heart attacks and strokes. These concerns were exacerbated by the well-publicized deaths of four (4) high-profile professional athletes who were known to be ingesting ephedrine-based dietary supplements and those supplements were found partially responsible for their deaths. In Thailand, where the Kratom plant is indigenous, the plant has traditionally been ingested by laborers as a stimulant. In 1943, the Thai government passed a law making it illegal to plant Kratom trees and ordered all Kratom plants destroyed because opium users were substituting the Kratom leaves for opium, causing the Thai government to lose tax revenue derived from the opium trade. Opium users found Kratom use caused milder side effects than opium, and by using Kratom leaves the users were able to wean themselves from opium addiction. Thailand’s efforts to eradicate Kratom were ineffective because the tree flourished naturally. In 1979, the Thai government scheduled Kratom as a narcotic in an effort to control its sale and consumption.2 The Thai Office of Narcotics Control Board is considering decriminalizing Kratom in Thailand because of the plant’s historical and cultural significance to the Thai people. The possibility exists that the Board is considering lifting the ban on Kratom to take advantage of the potentially large North American market. In 2014, the family of a subject whose manner of death was deemed a suicide in Palm Beach County attributed the death to an addiction to Kratom. In that case, Mitragynine quantification was not available rendering a determination as to the possible effect of Kratom on the subject unavailable as well. The presence of other controlled substances may have contributed to the subject’s state of mind at the time of the suicide. This incident was causal in the Broward County Commission’s proposal to ban the distribution of Kratom in the county in 2014. The Broward Commission ultimately decided to await further research before proposing a ban on the distribution of Kratom in Broward County. In an effort to ascertain how widely available Kratom was in the region and to determine if Kratom and similar drugs posed a significant threat to public safety in the area, FDLE special agents in Pensacola located over forty locations including gas stations, “head shops”, Vapor stores, and carry-outs selling derivatives of Kratom and made purchases of these products. These purchases usually consisted of bottles of commercially available “Viva Zen” or “Fly Away”, which are liquid forms of Kratom, or commercially prepared packages of Kratom capsules or tablets. Agents also purchased Kratom in the form of a plastic cigarette which the agents had previously only seen online. This was the only occasion the agents found a plastic cigarette for sale in a store. On two occasions, agents went to a specific “head shop” in an undercover capacity and observed a clear plastic bag in a display case containing what the proprietor claimed was Kratom. The proprietor told the agents, who were posing as customers, that he had packaged the Kratom for sale in the store, and that the Kratom he had personally packaged was cheaper than the commercially available packages of “American Kratom” he also sold. Agents purchased both the commercially packaged “American Kratom” and the Kratom packaged by the proprietor from this location. Agents were also able to purchase Kratom online utilizing Craigslist on one occasion. A check conducted at a regional medical center for Kratom-related health issues in the Pensacola area was negative. None of the six other FDLE regions report any significant information in reference to Kratom. To date, FDLE laboratory submissions from 2011 to 2015 have been low; one (1) in 2011; none in 2012; four (4) in 2013; three (3) in 2014; and six (6) through November 2015.
reported two (2) lab submissions, both in 2013, relative to Kratom; one (1) was a package of “Spice”, and the other was a powder/plant mixture. In both of the Indian River cases, the lab reported, “the presence of Mitragynine was indicated but not confirmed”. Manatee County reported no submissions of Kratom or Mitragynine. The lab in Sarasota County reported no laboratory submissions in reference to Kratom or Mitragynine. Broward County reported one (1) submission of Mitragynine in 2012. The laboratory in Miami-Dade had one submission of Mitragynine in 2012. A survey of the designated Florida High Intensity Drug Trafficking Areas (HIDTA) revealed no significant report of Kratom activity in any of the HIDTA jurisdictions. The Florida HIDTA regions are divided as follows: The North Florida HIDTA region consists of 10 counties with a population of 1,843,371. The Central Florida HIDTA consists of eight (8) counties with a population of 5,711,068. The South Florida HIDTA consists of four (4) counties with a population of 5,730,701. The three (3) Florida HIDTA’s have a combined total population of 13,285,140 (approximately 67%) of Florida’s 19,893,297 residents. The number of Florida residents residing outside of a HIDTA region is 6,608,157. The graphic below depicts the three Florida HIDTA areas of responsibility: Wuesthoff Reference Laboratories of Melbourne Florida, which conducts toxicology testing for seven of Florida’s Medical Examiner districts, reported that from January 1 through November 2015, Mitragynine was present in eleven cases analyzed by the lab. These results did not indicate that Mitragynine was the cause of death, but rather that the substance was present at the time of the analysis. Florida’s twenty-four Medical Examiner’s (ME) districts were also surveyed in reference to incidents of Mitragynine and 7-hydroxymitragynine. Nineteen ME districts responded and reported a total of eight (8) incidents involving a positive result for the presence of Kratom. Two (2) of the incidents listed the cause of death as gunshot wounds; one (1) of those was a suicide and numerous drugs, including cyclobenzaprine, cocaine metabolite, diphenhydramine were also present, and the other involved the intrauterine death of a fetus that died as the result of the mother sustaining a non-fatal (to the mother) gunshot wound to the stomach. District 1 reported one (1) death from multiple drug intoxication where Kratom was present. The cause of death listed Alprazolam, Gabapentin, and Clonazepam, with multiple other drugs present. District 9 (Orlando) reported three (3) deaths where Kratom was present but not the cause of death. One (1) of these deaths was found to be natural due to heart disease, though Mitragynine, caffeine, caffeine metabolite, and alprazolam were also present. Both of the other District 9 deaths were determined to be accidental; one (1) involved acute heroin and cocaine toxicity and the other involved intoxication by acetyl fentanyl. District 17 (Ft. Lauderdale) reported one (1) incident, and the cause of death was high levels of fentanyl and cyclobenzaprine with Kratom listed as contributory but not quantifiable. District 19 reported one (1) incident of combined drug toxicity in which the primary toxicity was due to Kratom usage. The Medical Examiner did not provide a quantitative analysis of the Kratom or any of the other drugs that may have been present at the time of death. In Vermont, the Board of Health declared Mitragynine and 7-hydroxymitragynine alkaloids of interest during an initiative to update regulations on bath salts and other synthetic cathinones. Vermont’s criteria for adding a substance to the regulated drugs list are case reports of the substance within Vermont or literature reviews of adverse effects of the substance. Medical examiners in Vermont have not attributed any deaths due to Mitragynine toxicity. In lieu of the DEA drug scheduling system, Vermont implemented drug “regulations” to monitor substances. The Kentucky Office of the Governor reported that though Kratom is not currently legislated in the state, a ban is under consideration. During the previous year, Kentucky officials noted only two (2) reported incidents relative to Kratom possession, and one of those was considered noteworthy only because the Kentucky resident was in possession of two (2) gallon-size baggies of Kratom purchased as a homeopathic remedy. The Kentucky Office of the Governor also expressed the opinion that Kratom will eventually be banned in the state because of bans already enacted on salvia and synthetic marijuana. Kentucky looks “unfavorably” on any product that produces similar physical effects as already banned substances. The Kentucky Office of the Governor postulated that the possession of Kratom would likely become a Class B misdemeanor with a penalty of incarceration not to exceed thirty days. The Michigan Poison Control database reports only two (2) hospital visits in the state in reference to Kratom which is currently legal in the state. A house bill was proposed in 2014 which would have made Kratom a schedule V drug, but no legislation has been enacted in Michigan to date. In Indiana, Kratom has been illegal since 2012 because it contains Mitragynine and 7-Hydroxymitragynine, both banned substances. The Indiana Poison Control Center reported just one (1) case of Kratom exposure in 2012, two (2) cases in 2013, and three (3) cases in 2014. Indiana experiences too few incidents in reference to Kratom to consider it a significant problem. The Chief Deputy for the Ohio Attorney General reported that it is not illegal to possess Kratom in Ohio, though in Ohio it is illegal to possess something that is intended to be used as a drug unless it is approved as a drug by the FDA. In North Carolina, Kratom possession is legal, but when encountered officials typically see Kratom in submissions along with scheduled synthetic cannabinoids. After state laboratories documented four (4) cases of Kratom possession, in 2013, Wisconsin enacted legislation making the possession, distribution, and manufacture of Kratom illegal. In Wisconsin, the controlled substances board can consider the findings of the FDA and the DEA when considering passing state legislation in reference to any substance that has been found to have the potential for abuse, and has made Kratom a Schedule I substance. No known deaths have been attributed to Mitragynine toxicity in Wisconsin, and the legislature is considering removing Kratom from the Schedule I classification. In Tennessee it has been illegal to sell or to possess Mitragynine or hydroxymitragynine since July 2013. The Tennessee Bureau of Investigation (TBI) reported that though Kratom had been seen in laboratory submissions around the state, no Tennessee Medical Examiner information is available. Kratom is not currently a scheduled substance in Tennessee; however, possession of Kratom has been categorized as a Class A misdemeanor which has deterred merchants from selling Kratom-based products. In North Dakota, there exists no legislation in reference to Kratom, and recorded no instances of Kratom use in the state. Illinois does not record instances of Kratom usage or abuse. However, the state has enacted legislation making ingestion of Kratom illegal for persons under eighteen years old. Kratom is legal for persons over eighteen years of age in Illinois. Louisiana passed Act Number 355 in 2012 prohibiting the distribution of products containing Mitragyna speciosa to minors. The penalty for violating this legislation in Louisiana is a maximum five hundred dollar fine and not more than six months imprisonment. In mid-September 2015, a West Baton Rouge Parrish, Louisiana Sheriff’s Deputy performed a car stop for a traffic violation on a vehicle travelling eastbound on Interstate 10. A probable cause search of the vehicle was conducted and eighteen pounds of powdered Kratom and several hundred canisters of butane were found in the passenger compartment. The Deputy did not seize the butane or the Kratom because Kratom is not a controlled substance in Louisiana. The driver, a resident of South Carolina, was allowed to leave with his vehicle. 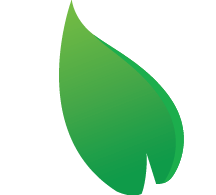 The relation between the Kratom powder and the butane is unknown, although some open source materials report that butane is sometimes used during Kratom extraction processes. The lack of Mitragynine ingestion and exposure reporting continues to be an intelligence gap. Legislative attempts to regulate Kratom in Florida in 2015, specifically HB287 and SB764, both of which would have made Kratom a Schedule I controlled substance, failed to be passed into law. The Florida legislature will soon consider HB0073 which would, if enacted, place Mitragynine and 7-Hydroxymitragynine, the major active alkaloids of the Kratom plant, on the list of Controlled Substances under Schedule I listed in Florida Statute 893.03. By definition, a Schedule I drug is defined by the Drug Enforcement Agency (DEA) as “substances, or chemicals with no currently accepted medical use and a high potential for abuse. Schedule I drugs are the most dangerous drugs of all the drug schedules with potentially severe psychological or physical dependence.” Heroin, LSD, and marijuana are all Schedule I drugs. By comparison, “Schedule II drugs, substances, or chemicals are defined as drugs with a high potential for abuse, less abuse potential than Schedule I drugs, with use potentially leading to severe psychological or physical dependence. These drugs are also considered dangerous.” Cocaine, methamphetamine, and fentanyl are three examples of Schedule II drugs. Drugs with lower potential for dependence fall in to Schedule III, and include substances such as Tylenol with codeine, anabolic steroids, and testosterone. The categories Schedule IV and Schedule V each have lower potential for abuse and risk of dependence respectively. A host of media articles and a review of open-source website reporting in Florida reveal that there are Floridians that ingest Kratom or its derivatives on a regular basis and see the use of Kratom as a homeopathic or alternative therapy for such maladies as depression, Lyme disease, chronic pain, and drug addiction. These Kratom consumers continue to extol the plant for its therapeutic properties and decry the Florida legislature’s attempt to ban, or regulate, Kratom. There is currently no accepted or recognized medical use for Kratom. Kratom use is not monitored by any national drug abuse surveys and much of the information regarding any deleterious effects of Kratom use or abuse remains anecdotal and is another identified intelligence gap. 1 U.S. Food and Drug Administration. Import Alert 54-15. 2015 September 4. Web. 10 September 2015. 2 Kratora. 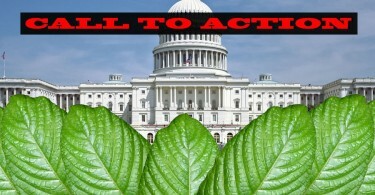 The Kratom Act 2486: The Thailand Ban on Kratom. 27 December 2012. Web. 10 September 2015. 2013. Document. 8 September 2015. <http://www.deadiversion.usdoj.gov/drug_chem_info/kratom.pdf>. 4 U.S. Department of Justice Drug Enforcement Administration. Drugs of Abuse. 2015. 2015.
blend Krypton.” JOURNAL OF ANALYTICAL TOXICOLOGY (2011): 1-7. Article. 11 September 2015. 6 Sarasota County. Ordinance No. 2014-013. 2014. Accessed in 2015. 7 U.S. Food and Drug Administration. Marshals Seize Botanical Substance Kratom from Southern California Facility. http://www.fda.gov/NewsEvents/Newsroom/PressAnnouncements/ucm416318.htm>.